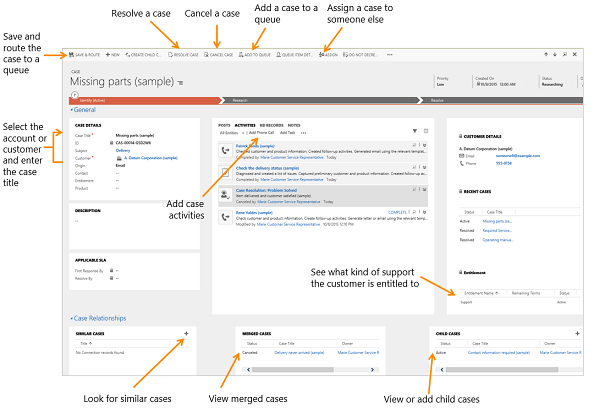 Keep track of your customer requests and issues by creating support cases in Dynamics 365. When a customer contacts support with a question or problem, you can quickly check if there is an existing case or open a new case and start tracking the issue. You can also escalate, reassign, or put a case back into the service queue if you don’t have enough information or time to work on it. To help you select the right status of a case, your admin may have set things up so that you only see a limited set of statuses based on the current status of a case. For more information on the available list of case statuses, contact your administrator. Go to Service > Cases. Click the Customer lookup button. By default, this field shows both account and contact records. Or, type a few letters and press Enter to search for records that contain the letters. When you select an existing customer, the customer details will show the contact details, along with recent cases and activities for the customer. If a customer record doesn’t exist, click New in the inline lookup results to create a new record. Click the Contact lookup button and select an existing contact for the case or click New in the inline lookup results to create a new contact record. From the Identify area of the process bar, click the Find Case lookup button and then select a case from the list of cases. If a case doesn’t exist, click New in the inline lookup results to create a new case record. To track your conversation with the customer, add activities. To see what kind of support you should provide the customer, click the Entitlements lookup button and select an active entitlement. When a case is created and an entitlement is applied to it (or when the case gets resolved), the entitlement terms from the associated entitlement are decremented. However, if you don’t want the entitlement terms to be decremented for a case, from the command bar click Do not decrement entitlement terms. Fill in the other details that apply to the case, and then click Save.